Things don’t have to be complicated. 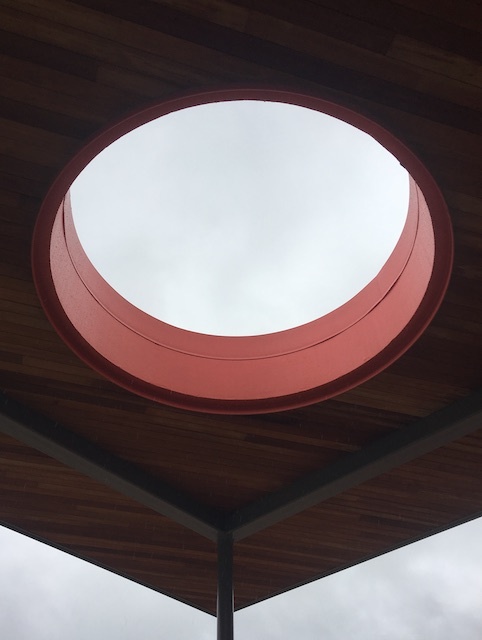 This opening in a canopy at a local elementary school is made up of simple parts such as steel framing, wood decking, steel columns, and aluminum panels. They were combined to create an inspiring form that allows light to shine through and enables kids to have a framed view of the sky regardless of the weather. The clarity of the form also makes it easy to remember. It didn’t have to be included in the project and it was likely more expensive to have it framed and finished. It makes an impression because it’s not something that you see every day and it is a conversation piece for the kids as they are waiting to be picked up from school. Clarity can bring focus and attention to your work. Distilling an idea to its essence, or creating a concept that is crystal clear, takes patience, discipline and the ability to say no–no to ideas, thoughts, and other clutter that will dilute and weaken your work.